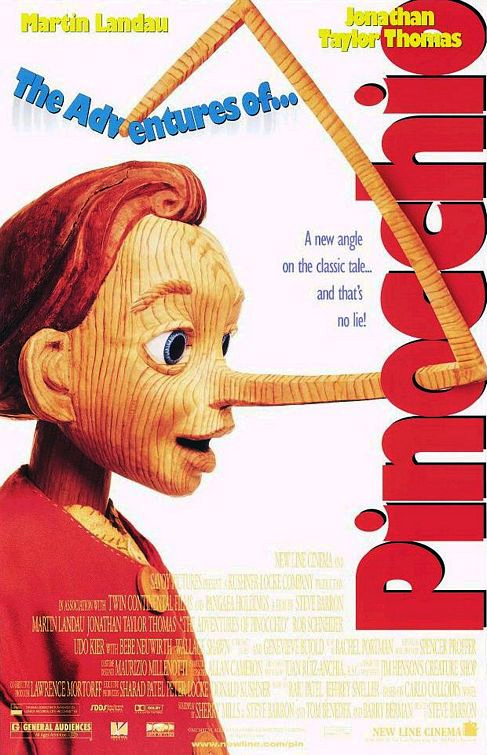 Live-action version of the classic story of the wooden puppet who becomes a real boy. VIOLENCE/GORE 2 - Schoolboy taunts. A woodpecker pecks on Pinocchio. Pinocchio is mischievous (runs across rooftops, throws flour in a bakeshop, etc.). Some fisticuffs. An evil puppeteer wants to steal Pinocchio, Pinocchio is kidnapped, a wild roller coaster ride that goes through a shadowy tunnel, boys turn into donkeys, Geppetto and Pinocchio are swallowed by a sea monster and then spat out. DISCUSSION TOPICS - Unrequited love, fatherhood, boyhood, lying, ambition. MESSAGE - Love can make your dreams come true.